Every winter, after weeks of eating hearty soups and stews, I start craving something really light and fresh. I just get sick of all of the super cooked down hot food. I want bright, I want it to taste like SUNSHINE. You know what I’m sayin’? 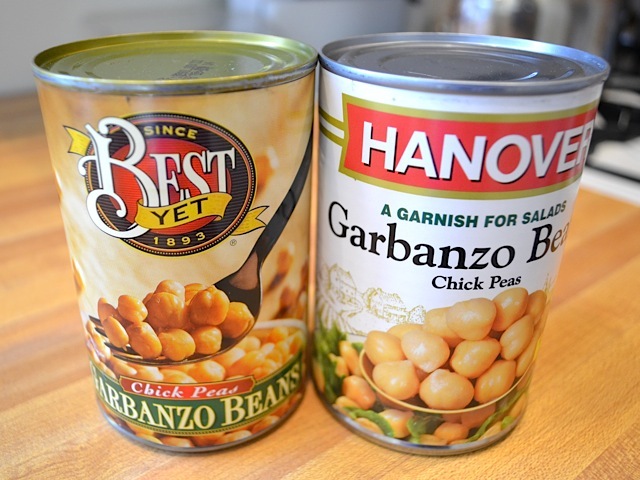 So today I threw together this quick salad with a couple of cans of chickpeas that I had hiding in the back of my pantry. It’s really fast, easy, and bursting with fresh flavor! Lime juice can sometimes have a slightly bitter bite to it, so if you’re not into that or limes just aren’t available in your area, this salad would be just as delicious with lemon juice. If you want to cut the price in half, cook your own chickpeas from dry. I haven’t done it but I’m sure it’s just as easy as cooking any other bean… especially if you cook them in the slow cooker! Another interesting twist to this salad would be to add a touch of honey and chopped jalapeno. Unfortunately, I didn’t think of that until just now as I was typing this. Someone try it for me and let me know how it is! Thanks! 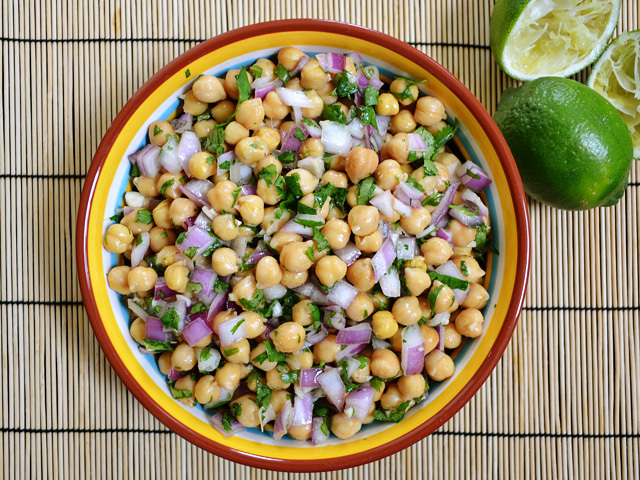 This cumin lime chickpea salad has buttery chickpeas, red onion, cilantro, and a homemade cumin lime dressing. Empty both cans of chickpeas into a colander and rinse with cool water. 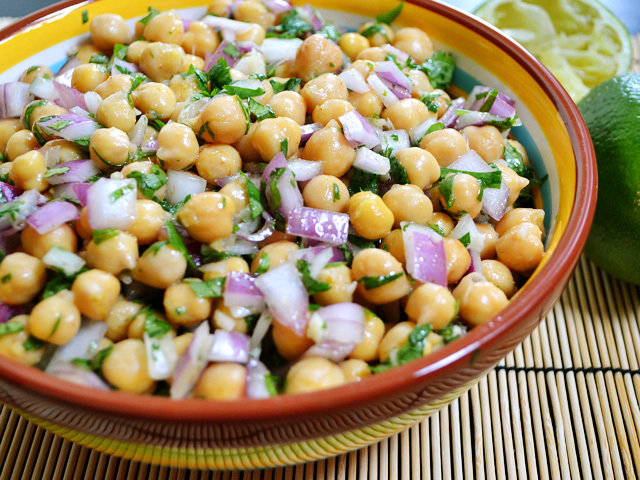 Let the chickpeas drain as you prepare the rest of the salad. 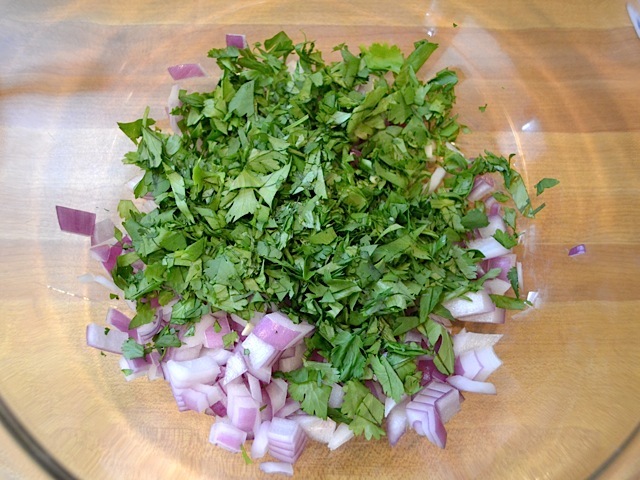 Remove the cilantro leaves from the stems and then roughly chop. Dice the red onion. Place both in a large bowl. Prepare the dressing by squeezing the juice from one lime into a bowl and adding the olive oil, cumin, cayenne pepper, and salt. 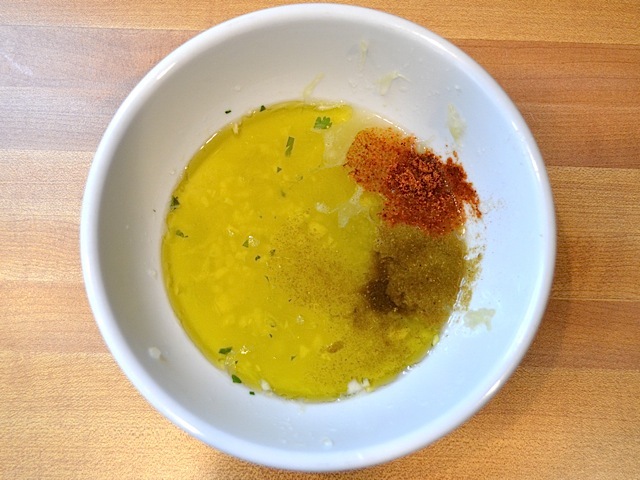 Finely mince two cloves of garlic and add them as well. Stir everything to combine. Taste and adjust salt to your liking. 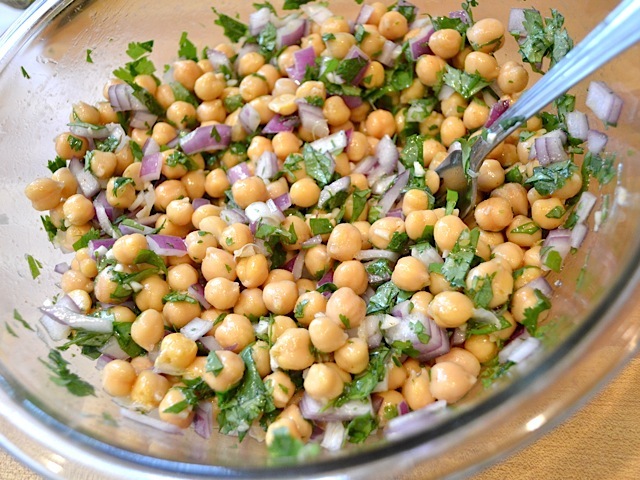 Add the drained chickpeas and the dressing to the bowl with the cilantro and onion. Stir to combine and then serve! The flavor intensifies the longer it sits so, refrigerate before serving for a stronger flavor. Cilantro, lime, garlic, and onion! This really is my favorite combo. Anytime I need something to taste fresh and vibrant, this is what I reach for. 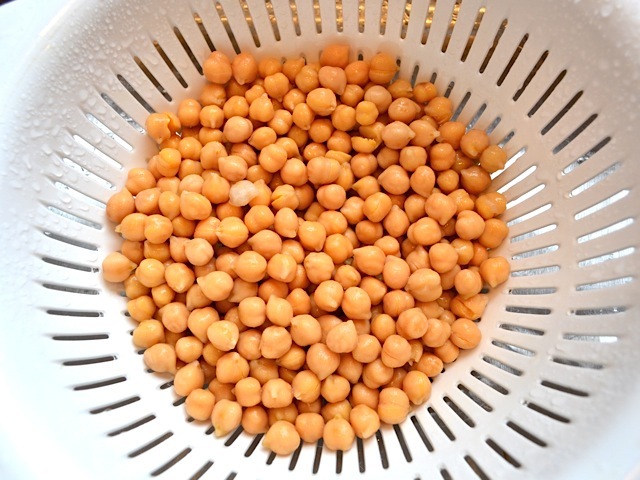 Rinse the chickpeas in a colander with cool water to remove all of that canned flavor. I’m sure making fresh chickpeas from dry would not only be more inexpensive but the flavor would be even more clean and fresh. Note to self: make fresh chickpeas. 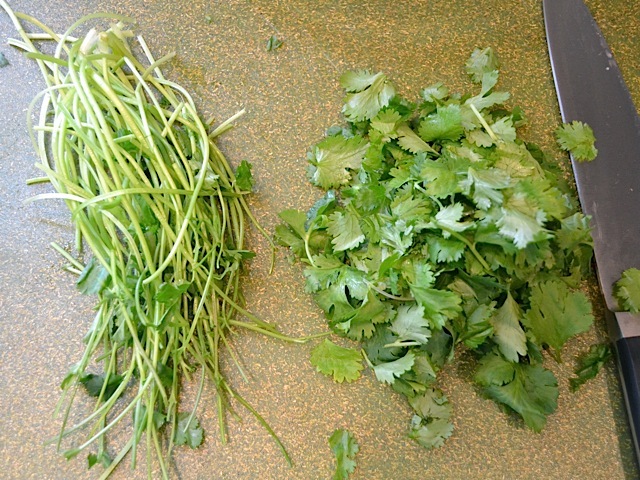 Remove the leaves from the stems of the cilantro and then give them a rough chop. The leaves pull off easily so this should take no more than a minute or two. 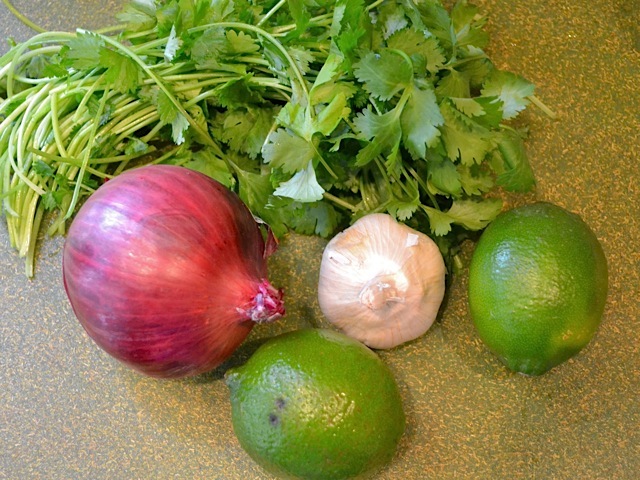 Dice the red onion and place it in a bowl with the cilantro. Squeeze the juice from one lime into a bowl and add the olive oil, cumin, cayenne, and salt. Mince the garlic and add that as well. 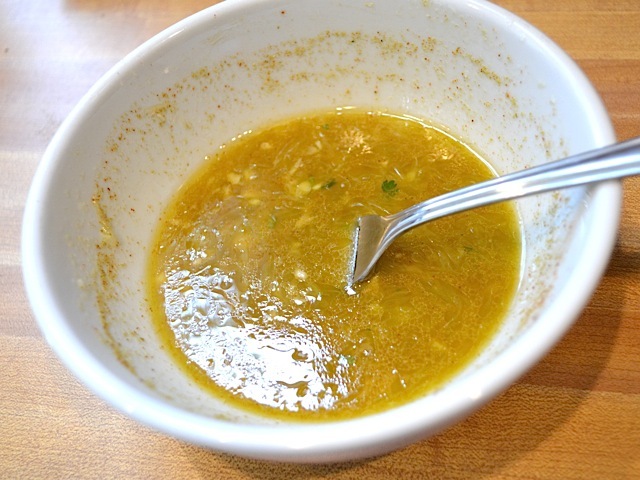 Stir it all up and now you’ve got a delicious cumin dressing. Give it a taste and adjust the salt and any other ingredients as you see fit. 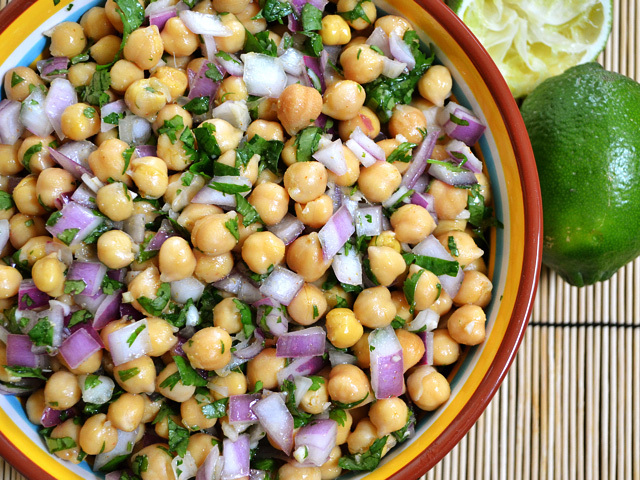 Add the drained chickpeas and dressing to the bowl with the cilantro and onion. Stir until everything is coated in dressing and then serve! The salad will be even more intense the next day! …if it lasts that long! Have you tried to add fresh coconut? So yummy! I didn’t have lime so I used fresh lemon juice & threw in 2 ripe chopped tomatoes (I made 1/2 recipe) it was so scrumptious! Thank you! I followed suit on another reviewers suggestion and added honey (to taste) to the dressing and some minced jalapeno to the salad. Perfect! Ive made this so many times and its truly amazing. I always add some agave and jalapeno to it. Im cutting back on oil and wondered if the dressing would work without oil in it? Looks like a great recipe! Want to try it tomorrow for dinner but I’d like to use it more as a main, so wondering if you think bulking it up with some cooked quinoa (or some other grain) would work/ taste ok? P.S. Love your ideas on here! I think quinoa would be great with this! You may need to make a bit more dressing to make up for the extra volume, though. On your recipe for Super Fresh Cucumber Salad, you recommend soaking red onion in ice water to cut down its intense bite. Would you recommend that for this recipe as well? I’m just a bit skeptical of too much garlic + onions! This is one of my favorite recipes from your website. I have made this at least 10 times: bring to potlucks, serve with fish tacos, or a vegetarian filling option for tacos. I look forward to bringing this for lunch at my new job; I’ll just wrap in a tortilla or stuff in a pita. I don’t think I ever change anything…just eyeball and taste the dressing. As a new-to-your-website vegetarian student, I have to say, this was a nice surprise for the cost. Thank you for the lovely recipe, will be looking into more of your low-budget concoctions. I wanted to thank you for this recipe! Its so easy to make and very delicious. I make it almost every time I’m invited for a bbq and its a hit every time ^_^ so thanks! This is my 20 month old daughter’s favorite meal! She can’t get enough of it! I LOVE, LOVE, LOVE your blog! Thank you all of the work you put into it! looks yummy. Think I know what I’m having for lunch tomorrow!